Poems from the Vault – The Leaf. | musings at random. Poems from the Vault – The Leaf. 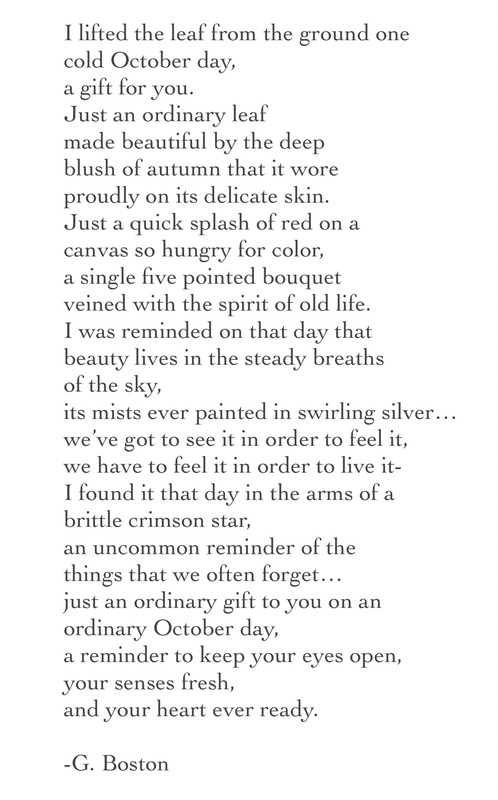 Autumn is right around the corner (finally); here’s a piece meant to rustle up the leaves in all of us. Enjoy. Stay creative. Beautiful. Although this time of year is when I decided to leave the comfort of my mother’s womb, I don’t enjoy it very much. I guess because I was born on an island where it is warm and so the temperature outside the womb was as close to inside😄 It’s not until we came to the states did I experience cold. Haven’t been a fan since! I hear you…that island living definitely has to affect your feelings about the cold! I am an eternal cold fan…the Ice King, haha. Thank you! Since fall is right around the corner, I had to break this one out. I’m sharing it on my FB page on October 1st. Thank you for reading, and for your support! Gotta get that fall vibe going full swing.